Not long after Flash arrived in the house, last May, he got hold of one of my pairs of glasses. I didn't realise and his little sharp puppy teeth scratched the crap out of my lenses. They're also quite old now, and although I don't wear them all day every day - I'm more or a driving and meetings glasses wearer - I think it's high time I got some new ones. 1. Orla Kiely VOK002 from Boots, 2 Ray Bans from My Optiques. 3. Scout Festival from Glasses Direct 4. Blaksmith from Archibal Optics 5. Sonoma from Swag and Stare. Which do you think? 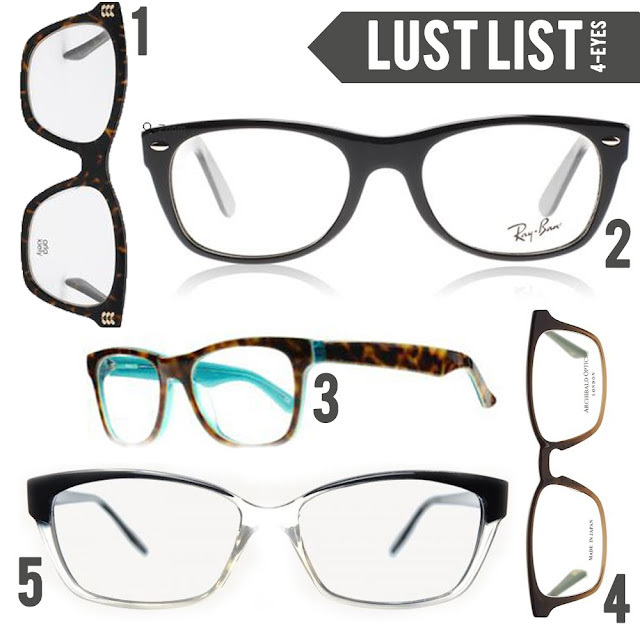 And if you're a glasses wearer too, where do you get yours from? I've always got mine from Specsavers too. I often think to look elsewhere but it takes me so long to chose the right pair that I'd rather do it in a shop than on-line. I'm hoping that the fact I can get the frames delivered to the house means I won't be spending quite so long pulling silly faces in the glasses shop mirrors. I got my Archibald's after doing their home trial service...couldn't believe how well they were made. Beautiful customer service from Dutch. I am used to Oliver People's but these blew them out of the water and at a third of the price it didnt make any sense but i guess that is the idea. Try them and you will see what im talking about. Ooooh, good recommendation. thank you. Ooooooh, i like the ombre effect! thanks for pointing them out to me. i might go ombre spotting now.